SAMUI: Beach Republic, the ocean club, resort and residences located on the island of Koh Samui, Thailand was awarded the Silver Medal at the prestigious OPP Awards for Excellence 2011 held at the ExCeL Centre in London. Director of Sales Robert Pestello (left) is presented with the Silver Medal by OPP's Geoff Hadwick. The awards were held during The Property Investor Show & OPP Live. The annual event focuses on the international property market and is attended by the world's top agents, developers, fund managers, wealth managers, service providers, and investors. 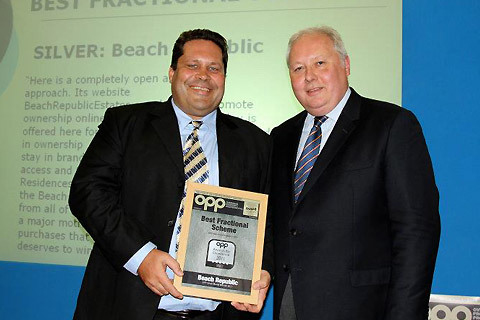 Nominated in the category of Best Fractional Scheme alongside shortlisted candidates that included some of the globe's premier shared ownership developments, the esteemed panel of judges awarded Beach Republic the Silver Medal. Beach Republic was commended for it's completely open and low-key sales approach, it's strong branding, and the attractiveness of the facilities made available to owners at the adjacent Ocean Club and Spa. The judges concluded that these qualities set Beach Republic apart from all of its competitors in the region. "It is an honour to be recognised at the industry's premier event. I want to thank everyone at OPP for considering Beach Republic alongside the world's leading fractional ownership resorts. After winning Best Shared Ownership at the Thailand Property Awards last year, it was clear that Beach Republic really is special. Now, to be commended on the international stage like this is truly humbling." Fractional ownership at Beach Republic allows an individual to purchase real estate without assuming any of the burdens that often come with sole ownership. All owners enjoy the various services and amenities of the deluxe resort. The brainchild of British real estate developer Tim Dean-Smith, Beach Republic opened in early 2009 and consists of 39 private pool villas, deluxe suites, and penthouse sky pool villas.